tendering for criminal legal aid work. Protect your clients’ right to have a solicitor of their choice. Stop these plans for justice on the cheap which will have devastating consequences. 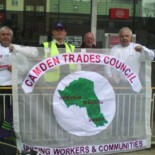 This entry was posted on May 20, 2013 by CAMDEN TRADES COUNCIL.